The signs are there along Virginia Avenue in St. Elmo that, after years of planning, a neighborhood greenway is coming soon. In a literal sense, new stop signs have appeared at every intersection with Virginia Avenue from West 41st Street through West 54th Street, temporarily turning each of those intersections into four-way stops to acclimate area drivers to a looming change. 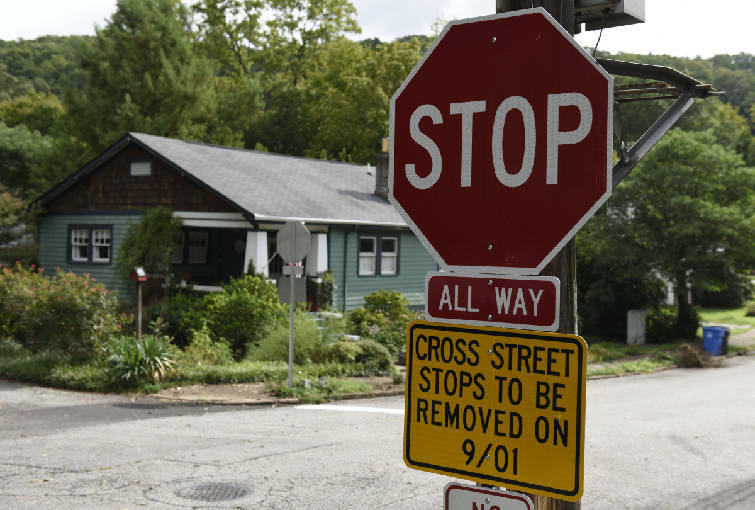 On Sept. 1, the city plans to remove all stop signs on Virginia, which will bring the neighborhood thoroughfare — already popular among pedestrians and bicyclists — one step closer to officially fulfilling its designation as Chattanooga's first neighborhood greenway. The project, initially eyed by St. Elmo residents in 2001, is coming to fruition as a result of the city's Complete Streets initiative and eventually will connect with the Tennessee Riverwalk when the riverwalk is extended to the base of the Lookout Mountain Incline Railway. Until then, the greenway, which is expected to be completed this fall on a $325,000 budget, will provide a biker- and walker-friendly link from the neighborhood it runs through to the St. Elmo town center, where the intersection of St. Elmo Avenue and Ochs Highway will be tightened and a pedestrian button will be added to allow easier crossing. A stop sign on W 46th Street at the intersection with Virginia Avenue is seen in the St. Elmo community on Thursday, Aug. 20, 2015, in Chattanooga, Tenn. Intersections at cross streets along Virginia Avenue are temporarily being turned into four-way-stops, but the Virginia Avenue stops signs will be removed on Sept. 1. "It's going to be great. It's going to be a transition, but when all is said and done, it's going to be a much-needed and welcome change." said Paige Wichman, president of the Community Association of Historic St. Elmo. "It's just going to be a big improvement for us as far as leisure activities, and people who would prefer to commute to work in something other than a car. It's just a game-changer." Virginia Avenue residents who rely on the road for driveway access are likely to have their routines altered in some way as the road becomes southbound-only for drivers between 47th Street and 55th Street. Safety poles will be added at various intersections from 47th Avenue up to the town center, meaning that some residents will have to use different streets to access Virginia Avenue than they have in the past. "There's other things to consider," said Merry Robinson, whose driveway can be accessed from Virginia Avenue and Beulah Avenue. "Not everyone is into biking. We're retired people, and all we want is easy access." Designers showed preliminary plans to residents to get feedback on possible changes for the project in October, and affected residents received a letter recently informing them of the impending changes. "It could be an inconvenience to those that live on [Virginia Avenue]," said Dan Rooy, who lives in the neighborhood and walks his dog on the street. "But I think this a good step for St. Elmo, especially for those that walk and ride a bicycle." The city applied for funding from the Tennessee Department of Transportation for the project in 2013 but was rejected. The budget for that version of the project was $993,510, which is more than triple what the city is spending on it. Having state funding would have allowed for a "gold-plated" version of the greenway, said Bert Kuyrkendall, the city transportation engineer who is directing the project. "But really, even with a lower budget, we're going to have the same effect," Kuyrkendall said. "It's going to bring direct continuity to the entire greenway. It's going to redo the intersection at Ochs Highway." City employees Scott Beavers, left, and Dustin Stephens install new stop signs at the intersection of W 49th Street and Virginia Avenue in the St. Elmo community on Tuesday, Aug. 18, 2015, in Chattanooga, Tenn. Intersections at cross streets along Virginia Avenue are temporarily being turned into four-way-stops, but the Virginia Avenue stops signs will be removed on Sept. 1. Virginia Avenue's greenway is just the first of many that city officials are eyeing. The next neighborhood greenway likely will be 14th Street between Central Avenue and Dodds Avenue, Kuyrkendall said. After that, Spears Avenue on the North Shore has been targeted. "We're working to do these kinds of projects in all the neighborhoods," Kuyrkendall said, "just to give people options on how to get around, and really just to, I think, create value in neighborhoods and provide amenities to the neighborhoods."